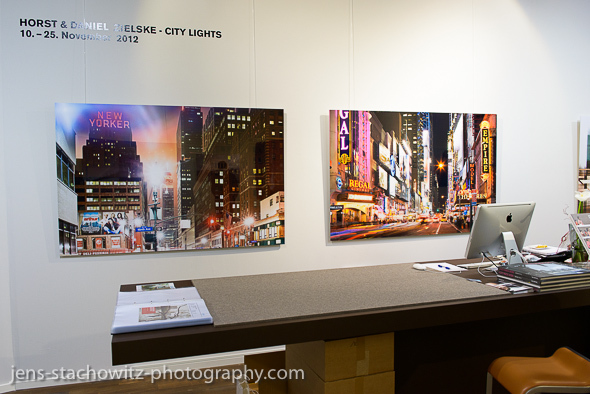 The opening of the LUMAS Gallery in Dortmund on 10.11.2012 was the start of the exibition of the New York photographs of Horst and Daniel Zielske lasting until 25.11.2012. 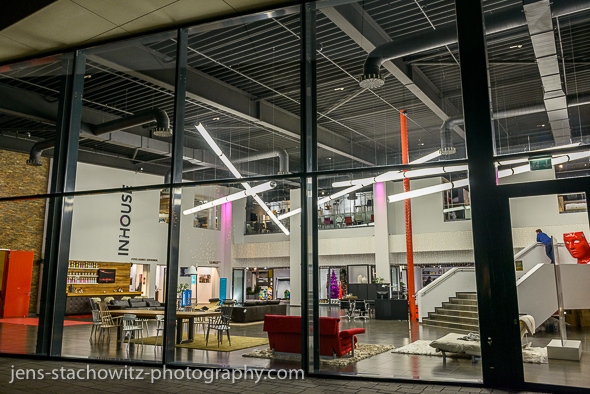 The showroom is part of the INHOUSE, a store for high quality furnishing and accessories. The New York photographs are very interesting for me because of the light and the subject. They seem a little bit surreal. The Brooklin Bridge is my favorite followed closely by the East River III. It is a pleasure to see the photographs in big format instead of merely in an online-presentation. The LUMAS Gallery showroom is well illuminated and is giving space to the photographs to appear. I could also see one of my favorites of Pep Ventosa an impressionistic photograph of the tree on the Carrer de Tantarantana, Barcelona. View into the INHOUSE Lobby in Dortmund at nighttime.